Welcome to a new kind of exchange company that focuses on putting the Member back in Membership. Start exploring the ways that DAE makes Exchange easy for everyone. Exchange is one of the most powerful benefits of Vacation Ownership and getting you where you want to go is our number one priority. With DAE it's simple, if you have a week, you get a week. Once your weeks or points are registered you can bank them and use them anywhere within the DAE Global Exchange System for up to three years. REGISTER & BANK Use your Member dashboard or call a DAE exChange Agent for assistance. REQUEST OR SEARCH Submit a custom request. Or search available inventory online. BOOK & CONFIRM All that's left to do is book your vacation and receive confirmation, it's that easy. DAE is your Global Exchange Company. With an ever-growing portfolio of resorts in storied lands around the globe, as well as more familiar ones close to home, DAE gives you access to a world of travel. Jump in and explore the destinations that await you. Friends and family need vacations too. That's why we never charge a thing when Members assign a booking to their loved ones. It's just one of the ways we're working to lower fees and make exchange easier for everyone. Through a simple process, Members can bank registered weeks and turn them into deposit credits with no obligation to book immediately. Deposit credits can be used at any time within three years. Members can even extend their credit for an additional 6 months for a small fee. As an added bonus, Members with valuable weeks that are in high demand may be eligible for perks. Join DAE today and check the PrimeTime Rewards list on the Member Dashboard to see if your week in included. Members can protect exchange and upgrade fees by selecting the Cancellation Protection Option (CPO) at the time of booking an exchange. In the event of a cancellation, your exchange fee is refunded to your member account, along with any associated upgrade fees for that reservation, ready for you to use any time in the next 2 years. Plus your banked week is preserved until the original expiry date. CPO cannot be used to cancel a Confirmed Exchange and then re-book the same Resort Week as either a Bonus Week or Additional Benefit. DAE asks that all members be fair and use CPO for its intended purpose, and not misuse it. CPO is not available for Bonus Week or Rental Bookings or any Special or Promotional offers. It is only there to provide a safety net for regular exchange weeks. Rental week cancellations are subject to the terms and conditions of the destination resort. DAE was founded on some core principles that will never change, including keeping fees reasonable and giving our Members freedom of choice. You'll love our unique blend of legendary customer service, ease of use, fair trading system, AND our exceptional value for money. *In some regions there is an additional cost if you wish to book an exchange with more bedrooms than your original deposit. Join for Free now or Contact your local office to find out more. DAE Members save every day on travel services and shopping. Enjoy discounted Bonus Weeks and savings on cruises, hotel stays, car rentals and activities through daeXtra. There's even a rental program offering discounted condo weeks. Bonus Weeks allow Members to book short-notice, discounted vacations within a 60-day travel window. Get low prices without giving up your week or DAE deposit credits. Bonus Weeks can be shared with friends and family and there's no limit to how many you can use. 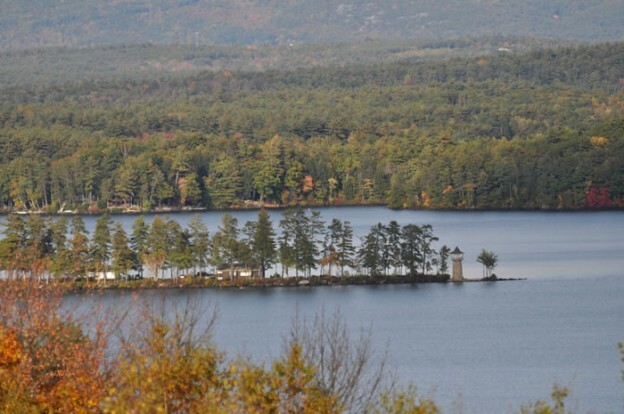 Cedar Lodge at Brickyard Mountain is located in the popular vacation community of Weirs Beach, New Hampshire, overlooking magnificent Lake Winnipesaukee, the perfect vacation location. Each unit at Cedar Lodge offers all the features and amenities that you expect, including, of course, fantastic lake and mountain views! Cedar Lodge has individual rooms, one-bedroom suites with full kitchens, and two-bedroom suites with full kitchens, and living room/full kitchen units with pull-out sofas or futons. Once the lakes freeze, the Lakes Region activities change to all things winter! More than 115 New Hampshire snowmobile clubs jointly groom over 6,830 miles of official trails extending from the Massachusetts border to Canada. In addition to this, the "little lake villages" begin to form as bobhouses are added. The Great Rotary Fishing Derby is always a big event, just down the road in Meredith. Or check out New England Pond Hockeys Tournament in February. This event has grown leaps and bounds since it started in Meredith Bay and is a site to see. The lodge itself sets peacefully atop the wooded peak of Brickyard Mountain, offering spectacular views of Lake Winnipesaukee and the surrounding mountain ranges. A trip to Cedar Lodge is a gracious return to peaceful surroundings, the rich natural beauty that has attracted visitors to New Hampshire for many generations. No matter what you like to do during your vacation, you can be sure that it can be easily found nearby. Enjoy the local year-round attractions and events, and plenty of great shopping. You may wish to simply relax on your balcony, by the pool or on nearby Weirs Beach. Any season of the year, Cedar Lodge welcomes visitors to all the fun that awaits on Brickyard Mountain. 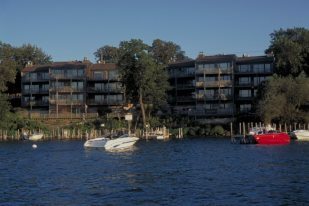 West Oaks Resort & Condominiums is nestled among the giant oaks along the edge of West Lake Okoboji, one of the most beautiful lakes in the world. In the heart of Iowa's Great Lakes region, these vacation homes provide great access to golf courses, amusement parks and, of course, the lake. Whether fishing, sailing, swimming or just hiking around the shore, fun is steps away. The two-bedroom condos feature full kitchens for deluxe meals, comfy living rooms and master bedrooms. But what makes this resort stand out is the quality of the furnishings, with carefully planned interior layouts featuring gas fireplaces and breakfast bars. Choose between a condo overlooking the shores of the water or go for a poolside condominium with whirlpool tub in the master bedroom. After a late afternoon swim in one of two outdoor pools, lie out on the lakefront decks and enjoy the beautiful sunsets. 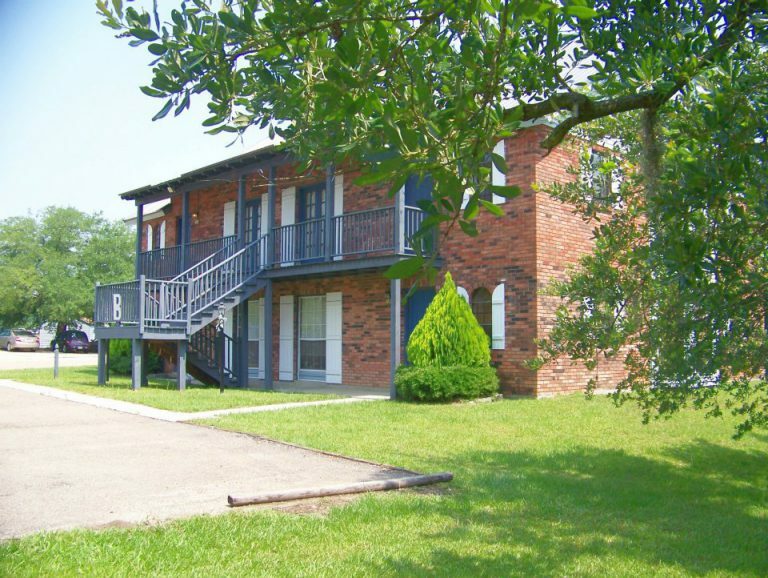 West Oaks is just minutes from the historic Arnolds Park theme park. Other major landmarks include the Central Emporium shopping mall and the Iowa Great Lakes Maritime Museum. A favorite nearby historical attraction is the Abbie Gardner Sharp Cabin Museum, site of the 1857 Spirit Lake Massacre. For nature enthusiasts, the beautiful Emerson Bay Recreation Area and State Park on the lake is also a short drive down the road. 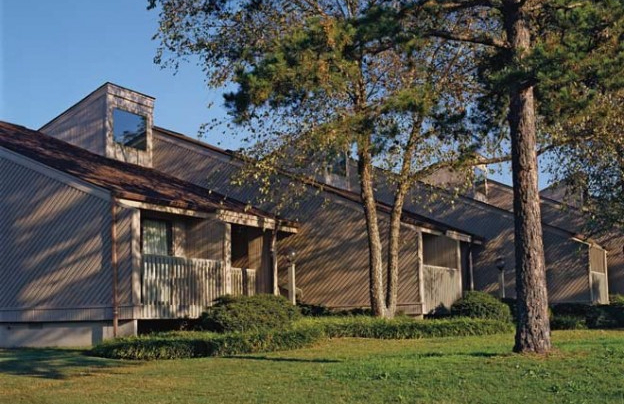 West Oaks Resort & Condominiums is a lakeside vacation for those who appreciate the finer things at home and don't like to leave home too far behind. If you love immaculate beaches, gorgeous golf courses and pure natural beauty, this place is for you! Experience the complete beauty of Hilton Head Island at Player's Club of Hilton Head. The Lowcountry beauty of coastal Carolina is evident on Hilton Head Island. Giant oaks, weeping willows and palmetto trees adorn the seven-acre landscape of this South Carolina island resort. A peaceful pond stocked with bass and brim is also located on the Players Club property for your fishing needs while the semitropical climate addresses your need for immediate relaxation. This laid-back yet active environment offers 28 Har-Tru, surface-lighted tennis courts, four of which are covered so you can even play on a rainy day. You'll enjoy full privileges at the Van Der Meer Tennis Center, too! The resort is also home to one of the finest health clubs on the island. Children can play at the nursery while you enjoy racquetball, swim laps in the indoor heated pool, de-stress in a yoga or Pilates class, burn some calories with aerobics or work out with a personal trainer. Afterwards, relax in the warmth of the hot tub. Walk three blocks to Coligny Beach, the best beach on the island, and catch some sun. Or simply lay out by the outdoor pool and enjoy your vacation. Hilton head has over 56 golf courses, over 300 tennis courts and over 200 restaurants, boutique and outlet shopping. Players Club is centrally located to enjoy all that Hilton Head has to offer. Come and discover an award-winning Ozarks paradise at Wyndham Resort at Fairfield Bay in Fairfield Bay, Arkansas. You can look forward to a dramatic change of pace from your typical, crowded theme-park-oriented destination. Instead of rollercoasters and cartoon characters, you'll find the majestic Ozark Mountains reflected in the 40,000 acres of beautiful Greers Ferry Lake, along with some of America's most spectacular caverns. <br /><br /> The resort offers spacious one- and two-bedroom deluxe suites that sleep up to six, decorated in warm tones with rustic furnishings. The sofa is big enough for the entire family! Each suite includes a partial or fully equipped kitchen, a washer and dryer, dining area, living rooms with pull-out sofas, multiple televisions, a stereo, and DVD players. Choose views of the golf course, mountains, woods or the lake from your patio or balcony. <br /><br />Greers Ferry Lake is one of the cleanest, purest lakes in America. Enjoy swimming, cliff diving, boating, scuba diving, camping, and a host of other aquatic activities, including fishing. The lake is famous for its rainbow trout! Wyndham Resort at Fairfield Bay also features an 18-hole golf course with a pro shop, 10 lighted tennis courts, and a fully staffed, fully equipped fitness center. Volleyball, basketball, shuffleboard and horseback riding on supervised trails, as well as activities for kids, are also available. <br /><br />If your ideal vacation includes outdoor adventure, scenic beauty and relaxation all served with a generous helping of Southern hospitality, start packing and make your way to Wyndham Resort at Fairfield Bay! Twin Rivers is located along the beautiful Fraser River in Fraser, Colorado. At Twin Rivers, each accommodation has a view of the Fraser River or Vazquez Creek, as well as a full kitchen, cable television and a gas fireplace. 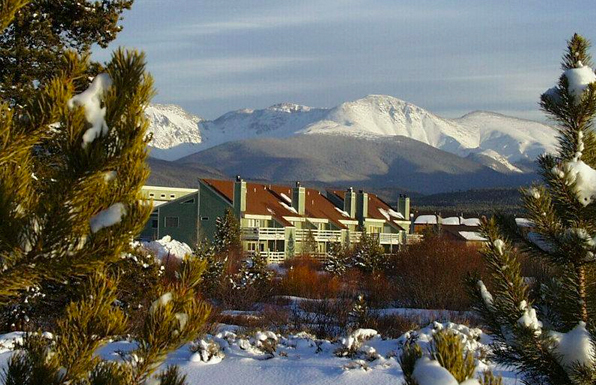 All suites also offer balcony views of the towering Continental Divide. 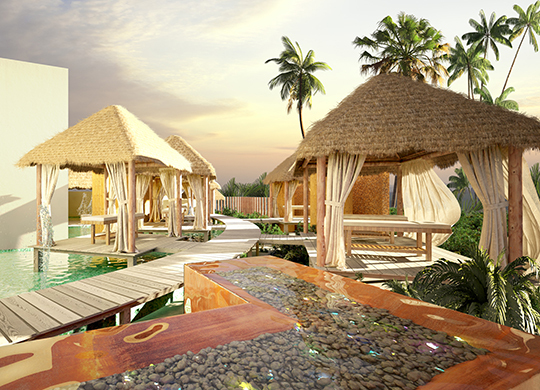 The resort grounds feature a heated spa, sauna and a children's play area. Close to Rocky Mountain National Park and just minutes from Winter Park and Sol Vista ski resorts, Twin Rivers is the ideal destination for family, friends and couples eager to share in the adventure and beauty of Grand County. There are all types of things to do all year around in the Fraser River Valley and Fraser and Twin Rivers is an excellent base for exploring north central Colorado. Even when it's not ski season, you have an abundance of choices, from visiting the Arapaho National Forest, to fly fishing, hot air ballooning, having a soak at the Hot Sulphur Springs resort, looking in on lots of museums, getting in the spirit of the West at the High Country Stampede Rodeo and for pure adventure, Colorado River rafting! From summer picnics in the park to skiing and snowboarding in the winter and enjoying a stroll through downtown Fraser's restaurants and shops, there's plenty to do at Twin Rivers! The elegance and serenity of the American Old South can still be found at Hillcrest Lake Villas Resort, located less than hour outside of New Orleans in the charming town of Abita Springs, Louisiana. Nineteen comfortable two-level, walk-up condos nestle alongside Lake Hillcrest on eight acres shaded by Spanish moss and sturdy live oaks. You might feel transported to a more genteel age, but you won't want for modern amenities, including complimentary Wi-Fi, satellite television, a sauna, full kitchen, fireplace, two bathrooms and plenty of closet space. Enjoy the saltwater swimming pool with waterfall, as well as the lake, which is perfect for birdwatching. Take a stroll around the picturesque grounds and down to the dock to see an eagle nesting in the cypresses, a stealthy gator, or even a beaver. Swing down to the neighboring Abita Springs Golf and Country Club for a game, or take the kids to the on-site playground. After a day taking in the sights, return to the serenity of a symphony of frogs, crickets and cicadas. If you're in the mood for a culinary adventure, you'll find some of the finest food in Louisiana at restaurants in downtown Abita Springs and nearby Covington and Mandeville. A leisurely drive from New Orleans, Baton Rouge or Biloxi will bring you to a land of swamp tours, alligator farms, airboat tours, gracious plantation homes and the very best of Southern hospitality. 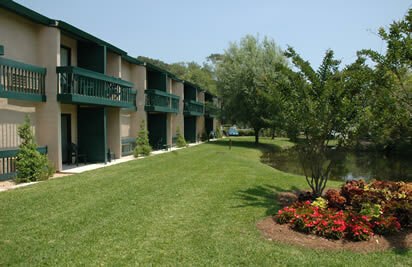 Experience it all when you stay at Hillcrest Lake Villas Resort! Members and their families and friends can book deeply discounted stays at timeshare and non-timeshare resorts worldwide. Enjoy access to a variety of available inventory, with no need to use a deposit credit or pay an exchange fee. Overlooking Isla Mujeres in beautiful Cancún stands the Ocean Spa Hotel, an optional all-inclusive haven on the Caribbean Sea. This exquisite resort offers comfortable rooms with a balcony or terrace, partial ocean views, cable television, and in-room mini bars. For a more pampering experience, stay in the spa deluxe rooms, which boast all the comforts of the standard suites but also feature whirlpool tubs, spa amenities and special access to the resort's spa. On-site amenities include two sparkling swimming pools, beach access, a tennis court, three restaurants and two bars, non-motorized aquatic sports, a fitness center, and mind and body activities, such as yoga, Pilates, tai chi, aerobics and basic stretching exercises. The showpiece of Ocean Spa Hotel, the Ya'ax Ché spa, boasts a complete array of spa treatments, all set within a two-story, world-class facility. Should you decide to explore the area, the hotel is located just minutes from downtown Cancún, shopping centers, restaurants and attractions. Complimentary one-way transportation from Cancún International Airport to the hotel. To arrange airport pick-up and payment of the all-inclusive fee, please contact the resort 10-14 days prior to arrival. So come, discover the pleasure of all-inclusive amenities, total relaxation and peaceful accommodations at the Ocean Spa Hotel in Cancún. With breathtaking views of the turquoise Caribbean Sea, Royal Sunset is an ideal place for a Cancún vacation. Experience the romance of Cancun's gorgeous beaches and the beauty of Nichupte Lagoon! The resort's all-inclusive plan includes unlimited meals and snacks at all our bars & restaurants, alcoholic beverages, exotic cocktails and non-alcoholic drinks, the all-inclusive exchange between Sunset Royal Beach Resort and Sunset Marina Resort & Yacht Club for increased dining variety. Plus, you get ground transportation between the Sunset Royal and Sunset Marina Resort & Yacht Club, a mini bar stocked daily with soda, beer and water in your room, and room service, yoga classes, entertainment, sports activities and a kids' program. A deluxe room includes a terrace or balcony with a view of Nichupté Lagoon. The junior suite includes a terrace or balcony with a view of the Caribbean or Nichupté Lagoon, while the one-bedroom suite with capacity for up to six has two bathrooms and a view of the Caribbean or Nichupté Lagoon from a terrace. The two-bedroom suite has capacity for up to 8 people, two bathrooms and a terrace or balcony with a view of the Caribbean Sea. The resort is close to popular entertainment but just far enough away for a quiet escape. Located on the grounds are a swimming pool, three hot tubs, a sauna, steam room, fitness center and gift shop. There are plenty of things to do at Royal Sunset, including aqua-aerobics, water polo, volleyball, lessons on fitness and dance, and bicycle tours. Cancun is perfect any time of the year and Royal Sunset is the ideal address for a vacation you'll never forget. Nested in a luxurious area in the heart of Cancun's Hotel Zone, within the magnificent Pok Ta Pok Golf Club, Laguna Suites Golf + Spa shares beautiful views of the golf course and unparalleled sunsets over Nichupte lagoon. At Laguna Suites Golf & Spa, your comfort and convenience are foremost in our minds. Our luxuriously appointed suites are fully air-conditioned and equipped with cable TV. Each suite contains an in-room safe for your valuables and daily housekeeping service is provided. You can swim in our own pool (complete with pool bar), or a free shuttle will take you to the beach every day from 8 a.m. to 9 p.m. every hour. You'll never go hungry or thirsty here. Our own Restaurant, Nicte-Ha (meaning water flower), serves a la carte meals practically around the clock, breakfast to dinner, from 7 am to 11 pm. We also have an open bar from 7 am to 11 pm, serving unlimited national and international liquors, cocktails, juices, and sodas. For nocturnal cravings, each suite has its own mini-bar and a coffee maker. Laguna Suites Golf + Spa is located in the heart of Cancun's vibrant Hotel Zone, close to all the action and Cancun's famous beaches. Swim, sail, surf and snorkel the Caribbean Sea's azures waters. Travel back in time to visit the spectacular Mayan ruins of Tulum, Coba and Chichen Itza - all within easy day-trip range. 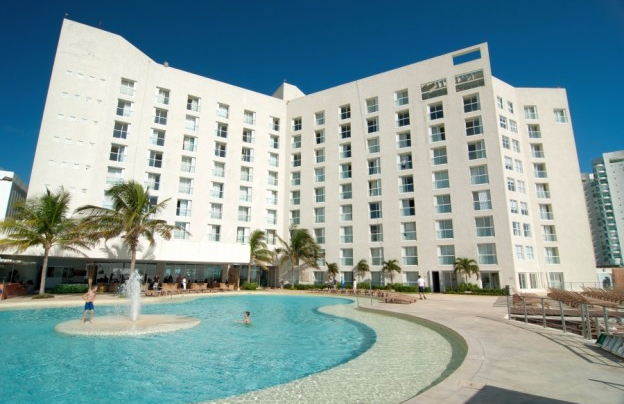 Cancun's cosmopolitan shopping, lively nightlife and gourmet cuisine are enticing as well. 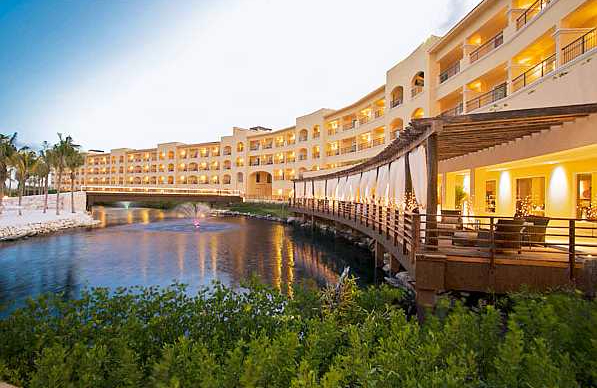 Enjoy Cancun with a vacation at Laguna Suites Golf + Spa! Azul Beach Resort Negril by Karisma is a five-star luxury resort located on Negril’s world-famous Seven Mile Beach, just steps away from the ocean. This Gourmet Inclusive® property boasts 18 lively restaurants and bars, a world class spa, countless pools with swim-up bars, and a picture-perfect crystal clear ocean with water sports and activities along the shore. Guests can indulge in everything from local delicacies and specialty rums, to private candlelit dinners on the beach. Situated on the breathtaking, award-winning white sands of Maroma Beach, El Dorado Maroma is ideal for guests seeking active relaxation in a luxurious boutique environment, with gourmet a la carte cuisine, infinity swim-up oceanfront suites, a full-service spa and impeccable service. Providing a secluded setting, the resort hosts 101 suites, ensuring that each guest receives the ultimate service, with a full-service concierge and beach butlers. Guests can also enjoy culinary events such as a Fresh Fish Market and Paella on the beach, plus deep sea fishing, motor boats and a variety of water sports at the marina next door. At the heart of every great story, there always seems to be a great meal. That's why at the heart of every El Dorado resort, there is the Gourmet Inclusive experience, with award-winning cuisine in a wide variety of settings. Chefs and servers have been trained around the world, bringing a level of passion, creativity, sophistication and service that rivals the finest restaurants on any continent. Whether you choose to sample every activity or to do nothing at all, the choice is all yours - and the setting is perfect no matter what you choose. Adults-only elegance awaits on one of the top ten beaches in the world at El Dorado Maroma, a Gourmet Inclusive resort. Named one of the top ten most romantic hotels in the world by Forbes, El Dorado Seaside Suites offers elegance for the carefree and relaxed. Spread along a white sand beach, this all-suite, adults-only resort blends luxurious amenities and creative a la carte Gourmet Inclusive® cuisine with a cool, boutique hotel ambiance where twenty-four-hour room service is included, as are the beverages and many other activities and services. Each of the suites features lovely décor and romantic double whirlpools for two, and all are just a few steps away from the beach. At the El Dorado Seaside Suites, every suite features striking modern décor, breathtaking ocean views, state-of-the-art amenities, and either a swim-up terrace or infinity pool balcony. All are located directly on the beach. With 24-hour room service, you may never actually need to leave your suite, but when you do, you'll find shaded, King-size Bali beds waiting for you on the beach, tended to by our attentive beach waiters. Don't miss the crystal clear waters just offshore, where countless fish dart around the reef. The beautiful Naay Spa offers unique spa treatments like Sky Massages, couples' massages and afternoons of relaxation in the steam room and saunas. 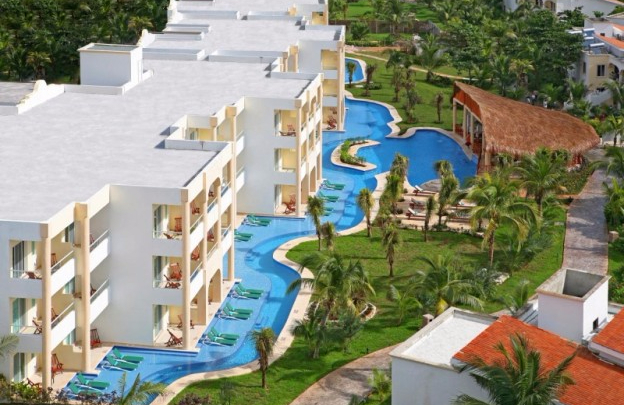 At El Dorado Seaside Suites, you can enjoy the atmosphere of a boutique hotel and still have it all. El Dorado Casitas Royale, by Karisma is one of the Riviera Maya's most luxurious adults-only resorts. It features all a la carte meals at the nine gourmet restaurants, oceanfront suites with double whirlpool tubs, daybeds on the terraces, outdoor open-air showers, 24-hour room service and pool and beach butler service. 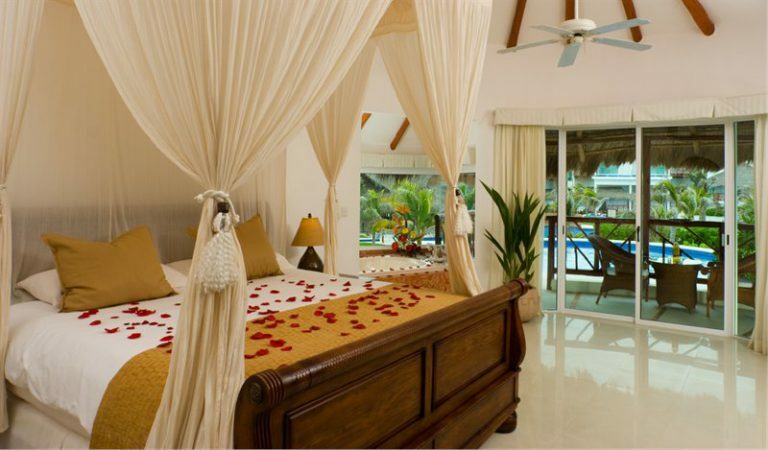 The resort also includes a complimentary honeymoon and anniversary packages with a beachfront candlelight dinner and a bottle of champagne and fresh tropical flowers in your room on day of arrival. El Dorado Casitas Royale has won the Wine Spectator Award of Excellence for its expert sommeliers and respected wine list. Voted one of Conde Nast TravelerÂ´s Top 100 Hotels in the world, El Dorado Casitas Royale is a recent winner of the prestigious AAA Four Diamond Award and ranked by Trip Advisor in the top 10 best hotels in Riviera Maya. 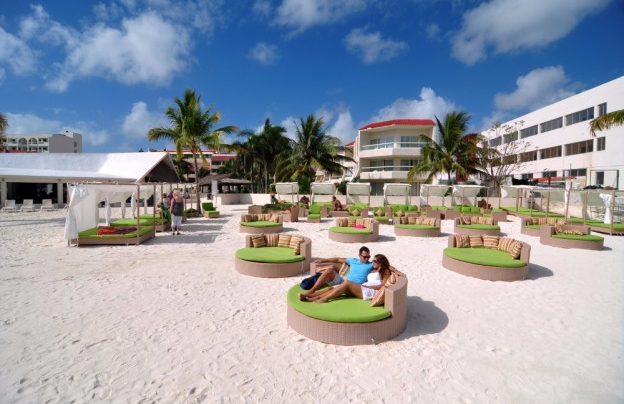 This is MexicoÂ´s premier adults only, beachfront resort, where couples, wedding parties and honeymooners savor a Gourmet Inclusive experience, and a vacation that fosters togetherness. Luxuriously romantic, stretching along a secluded beach, the resort provides indulgences from gourmet cuisine, to swim-up suites, to a lavish spa and concierge service. 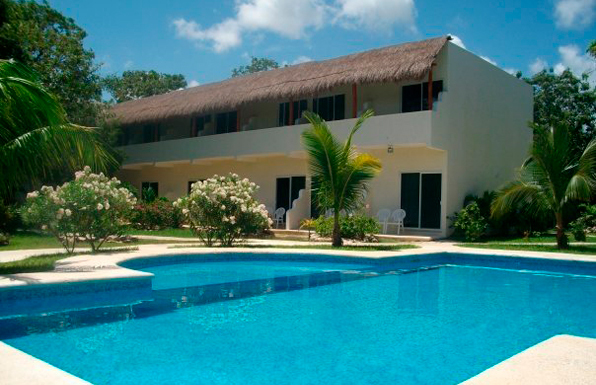 Located in the heart of the Riviera Maya, facing the beautiful Mexican Caribbean, the resort is 25 minutes south of Cancun International Airport, 15 minutes north of Playa del Carmen, and just 10 minutes away from Mayakoba Championship golf course, and 25 minutes away from the Playacar Golf Club. 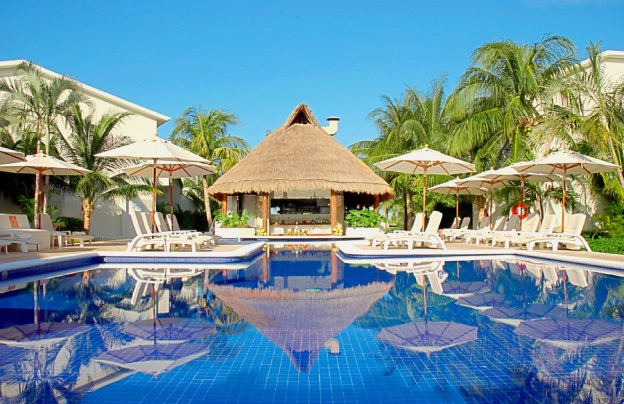 Relax, rejuvenate and rejoice in the elegance of El Dorado Casitas Royale. This casually elegant, adults-only beachfront resort offers an ideal setting for romantic and relaxing getaways. Luxuriously romantic and stretching along a secluded white sand beach, El Dorado Royale is ideal for vacationers seeking laid-back luxury. El Dorado Royale provides Gourmet Inclusive® indulgences such as nine a la carte gourmet restaurants, 24-hour room service, two full-service spas and fun activities such as tequila tastings, yoga, salsa classes and live entertainment. The 478 spacious suites include in-suite whirlpool tubs for two, daily restocked mini-bars, double sinks and private terraces. 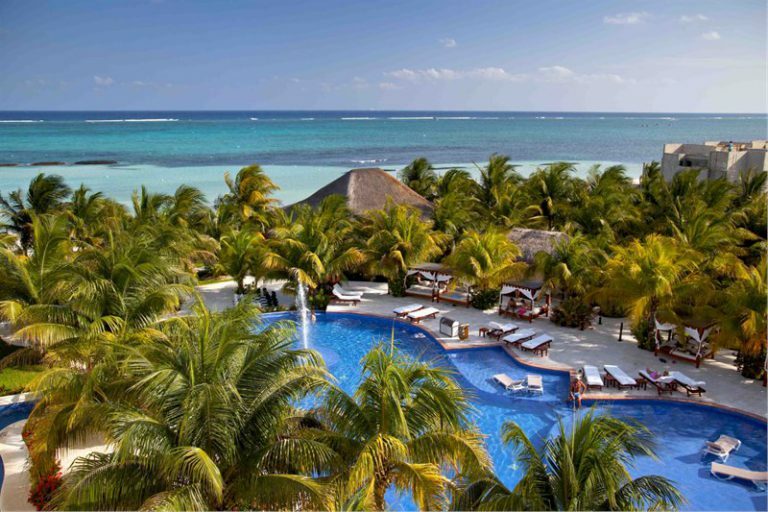 El Dorado Royale has earned the coveted AAA Four Diamond Award. Voted one of Conde Nast TravelerÂ´s Top 100 Hotels in the world, El Dorado Royale is MexicoÂ´s premier adults-only, beachfront resort where couples, wedding parties and honeymooners savor a Gourmet Inclusive experience, and a vacation that fosters togetherness. Luxuriously romantic, stretching on a secluded beach, the resort provides indulgences from gourmet cuisine, luxury swim-up suites, to a lush health club and personalized concierge service. Situated in the center of the Riviera Maya, facing the beautiful Mexican Caribbean, the resort is 25 minutes south of Cancun International Airport, 15 minutes north of Playa del Carmen, only 10 minutes from Mayakoba championship golf course, 25 minutes away from the Playacar Golf Club, five minutes south of Puerto Morelos and 35 minutes south of downtown Cancun. It's an ideal location on a serene beach, yet close to everything. 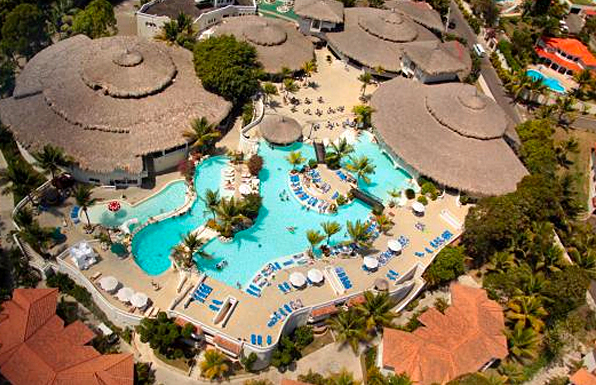 This family-friendly All-Inclusive Puerto Plata resort is located by the ocean, within 1 mile (2 km) of Playa Cofresi and Ocean World Adventure Park. 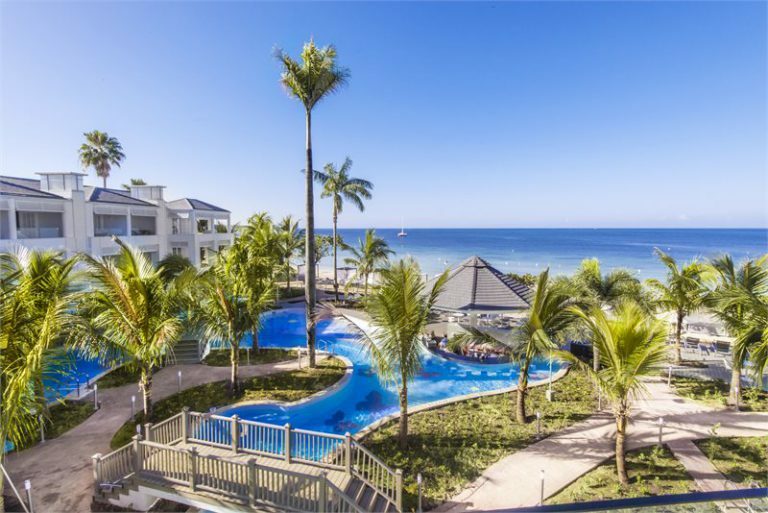 <br /><br />Part of the massive Lifestyle Holidays complex, this smaller, tranquil property attracts families and couples with its pristine pools and spacious suites. The Presidential Suites by Lifestyle are one of the most luxurious accommodations at the Lifestyle Holidays Vacation Resort, setting a standard of lavish comfort with 36 two-bedroom suites, filled with dark wood furniture and stainless steel appliances. <br /><br />Providing both service and features that are beyond compare, the Presidential Suites offer a unique luxury experience. As a Lifestyle property, the Presidential Suites provide the easy, relaxed ambience of the Caribbean in an opulent and elegant setting. Right on the property, Presidential Suite guests can enjoy amenities including a large centralized pool with waterfall; Jazz, a French fusion restaurant; Bourbon Street bar; three tennis courts; and a full-press lighted basketball court. With the beach and other amenities spread throughout the sister properties, it allows for almost unlimited activities and a relaxed, uncrowded vacation. Puerto Plata Cable Car and Los Mangos Golf Course are also within 3 mi (5 km). <br /><br />Puerto Plata is a beautiful scenic area with picturesque beaches with a breathtaking mountain backdrop. There is so much to do and so much to see in the Dominican Republic, and there's no better place to call home than the Presidential Suites by Lifestyle Holidays. Cofresi Palm Beach & Spa Resort - Dominican Republic is the newest jewel in the Lifestyle Holidays Vacation Club crown. Nestled along the Cofresi beach shores, and overlooking the sparkling Caribbean sea, this resort caters to the luxurious enjoyment of both families and couples looking for that perfect getaway. With 468 well-appointed accommodations that range from adult-only spa suites, to standard family friendly rooms in a quite setting between the ocean beach and spectacular pool, this is a paradise worthy of the Lifestyle name. Cofresi Palm is a relaxing, enjoyable and satisfying experience for all guests and their families. All rooms have air conditioning, cable television, and ceiling fans, and distinctive interiors featuring dark wood furnishings. Shaded patios and verandas are offered in some units. Cofresi Palm provides the easy, relaxed ambience of the Caribbean in an opulent and elegant setting. On the northern shore of the Dominican Republican stands the enchanting city of Puerto Plata. This well-kept secret is steeped in European and New World history dating back to 1502 when Nicolas de Ovando established a shipping base under the direction of Christopher Columbus. Visit the Fortaleza de San Felipe which protected the city from pirate attacks. Today, a galleried mansion houses the city's Museo de Ambar Dominicano, dedicated to the Dominican Republic's translucent amber. An ancient lighthouse, recently restored, harkens back to the days of massive Spanish galleons. Overlooked for decades, this lovely coastal city is fast becoming a destination of choice of vacationers throughout the world. As a timeshare owner or club Member, we know you love to travel. Now you can turn your travel dollars into rewards that take you further for less. As a DAE Member, you'll automatically earn daeRewards for each DAE transaction. daeRewards balances can then be applied to your DAE products and services. Every Member at every level earns valuable rewards. Members can pay for any DAE service with daeRewards or use a combination of rewards and cash. Choose a benefit level to see just how quickly daeRewards can add up. *Not combinable. View the daeRewards terms and conditions. Members with gold level benefits can also use their rewards for travel services like airfare, hotels, cruises and online shopping. Earning daeRewards is fun, but using them to save money is even better. When completing an online transaction for DAE services, such as booking an exchange, you'll automatically be able to apply the daeRewards you would like to use towards that purchase. “Thank you very much for making my experience delightful. You are the best and very knowledgeable. Greatly appreciated. I will be using you again for any of my vacation needs.” DAE Member, Susan S.